Growing up my dad was always a hunter, one of my friends actually called him “Hunter Dave”. I always wanted to hunt like my dad, so as soon as I was old enough we started building up preference points everywhere we could. 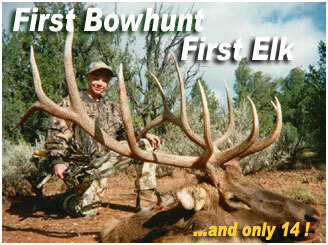 One of the places we made sure to put in was Arizona's archery Unit-9 elk. We started putting in when I was 10, and figured that by the time I was a Senior in high school I would be drawn. Then because of a lawsuit saying that the drawing wasn’t fair to non-residents they drew more tags for the 2004 hunt, and my dad, his friend Ralph, and I were all drawn. I was 14 years old and was totally excited about this once in a lifetime hunt. For the next two months I was shooting my bow 100 times a day, building up the poundage until I reached it’s maximum of 42 pounds (40 pound minimum according to AZ law). I was as ready as I could get, then I informed my teachers that I was going elk hunting. Soon we were on a long drive to Arizona. In Arizona we met our guides. My dad had interviewed many outfitters and decided on Rincon Outfitters. My dad was being guided by Randy Epperson, Ralph’s guide was Rom Dryden, and I was paired up with Jimmy Saye. We set up camp and got ready to hunt the next morning. Before dawn I was up and ready to head out. I grabbed a cherry turnover, and got in Jimmy’s truck. We drove about 4 miles along a dirt road and then hiked a mile or so out till we were at a tree with nice overhanging branches. The sun was just beginning to show over the horizon when the bugles started. First a bugle to the right of us, then to the left, then one right behind me. I was turning around in circles trying to face the bugle that seemed closest, but after an hour the bugles started to slow down, then there were none at all, I still hadn’t seen any elk. The next day we sat in a blind by a pond, hoping that one would come in. I used my cow call every now and then, but all the bugles were way far away. Eventually it started to get dark. I heard a bugle pretty close behind me. My guide used the cow call, and the elk ran up to the pond. He was a nice 5x5, but he had no mass or length. I passed on him. Later I found out that Ralph and Rom were watching from a hill through their binoculars. They gave busted me about passing it up, but I knew I would see more elk - probably a better one. The next day it was raining hard. We didn’t even start hunting until 10, but with the rain we knew that all the tracks were fresh. We found some tracks that crossed the road, so we got out of the truck and followed them. About a mile in we stumbled onto a nice bull with 2 or 3 cows. They winded us, and were gone before we realized that the wind had shifted. We continued tracking them for a long time. I was about to suggest giving up and going back to camp when we heard a bugle. It wasn’t far away, up in front of us. We started jogging towards the sound. Another bugle even closer, then another. Jimmy said to kneel down and draw. He had seen a diferent elk, and bigger. He snapped off a tree branch and started hitting the tree with it. Then I saw the elk's antlers. He was coming towards us - fast, and when he stepped out from behind a tree about 20 yards away, I was going to shoot. But changed direction and kept coming toward us. At 8 yards he turned broadside, then took a step quartering away. I focused my 20-yard pin just under his vitals, and hit him with the best shot I had ever taken. Immediately I knew it was a good shot! The arrow buried all the way to its fletching. We sat and listened for 5 minutes then heard it drop. It looked like it was going to rain again, so we took up after the elk. The blood trail was awesome, only about a foot between each puddle. Jimmy saw the elk before I did. He had fallen on the arrow, and his antlers were tangled up in the underbrush only 60 yards from where I shot him. He was bigger than he looked when I shot him! 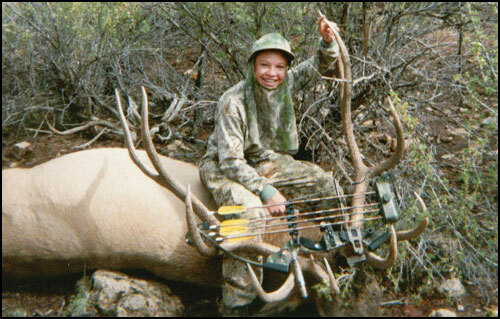 Click here to congratulate Nicholas on his first bow kill! We left the elk there and headed back to camp to wait for my dad. Just before full darkness, my dad and Randy came back. I ran up to them and told him about how we saw some elk, and casually slipped in that I shot at one. My dad didn’t catch on, so I said, “I got it.” My dad kept saying that I must be teasing him. The four of us went off to my elk and were ecstatic when they saw it! We ended up quartering it and hauling it back along a creek-bed. This was my first time archery hunting, and a hunt that I will never forget. My dad and Ralph both got elk a few days later. My elk ended up scoring 334 1/8 net Pope & Young, while my dad’s scored 318 2/8 gross Pope & Young. All while preparing for this hunt I had heard from my dad and many other people how good of an area this was, and they were right. The elk there must just have good genetics, because most of them are 5x5’s or bigger. This was a great hunt; the only downside is that my elk will probably dwarf any other elk I may ever get in my lifetime. Nicholas is 14 years old, a freshman in high school and lives in Chico, California. This was his first archery hunt. Nicholas used a Magnus stinger 4-blade 100-grain broad-heads, a PSE Spyder, and a Leica range-finder.